This elegant master bath designed by Alspaugh Kitchen and Bath uses painted molding mounted on the wall to emulate wall paneling. Combined with matching painted beaded inset cabinetry, the entire bathroom has a built-in appearance. The homeowners desired a classic white-and-marble look, but lower maintenance. To achieve the look, a combination of marble-sequel porcelain tiles, sintered stone countertops and real marble tiles were selected. With a strict white color scheme, attention to detail was essential. Two dormer windows and a slated roofline establish a lower crown height that was continued around the room. Indirect up-lighting and under-cabinet lighting bring airiness to the space. The tub was removed to make room for a larger shower with built-in seat and dual showerheads. The toilet was moved to the opposite end of the room for a more private space, and a window in the toilet room prevents the space from feeling too small. 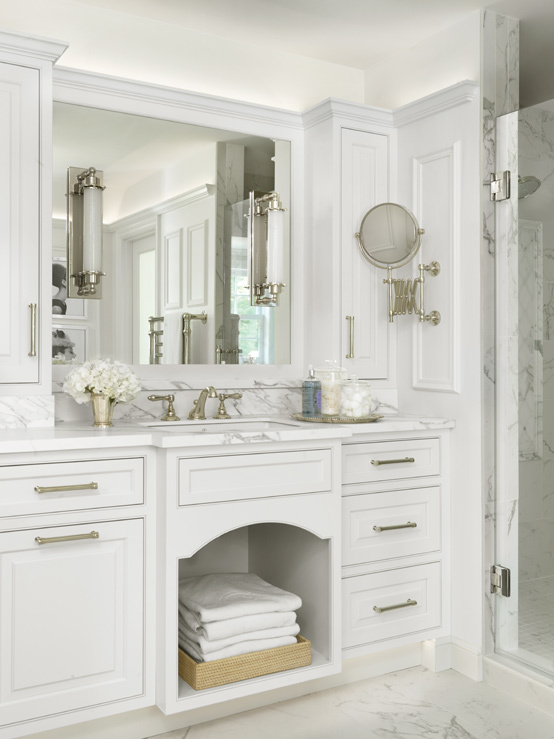 A heated floor and towel warmer enhance the luxury in this bath, while the open cabinets under the sink display towels to reinforce a feeling of soft comfort. A tall linen cabinet creates concealed storage space. A coffee bar is conveniently tucked under a dormer window. See stlouishomesmag.com for resources. The designer really used the home’s dormers to their advantage in the space. The cabinetry inset on the doors is elegant as is the mosaic rug pattern on the floor. The hidden barista is so cool, and the artwork is a nice complement to the overall space.